The Best Hyaluronic Acid Serums of 2018 – If you have dry skin, dehydrated skin, or are worried about your skin losing its firmness due to age or external factors–you’re on the right track with hyaluronic acid. One of the causes of these issues is the diminished ability of your skin to retain moisture. To reverse this and bring back your skin’s natural ability to retain water, re-introducing the key molecule that makes it happen–hyaluronic acid. To do this, you’d think you’d have to go under the knife or spend thousands of dollars on ridiculously expensive products but that’s not the case at all nowadays. If you understand what you’re looking to address, what the procedures are, and what ingredients you need; you can certainly find a solution among the hundreds of products that are out there. Dermatologist tip: Damp skin is more permeable than dry skin. For maximum absorption, make sure to apply serums on damp, freshly cleaned face. 0.1 What is Hyaluronic Acid? 1.10 Organic All-in-One Zen Power Serum, 10% Vitamin C, 20% Peptides, Hyaluronic Acid, Collagen Includes Matrixyl, COQ10 & more. 1 oz. 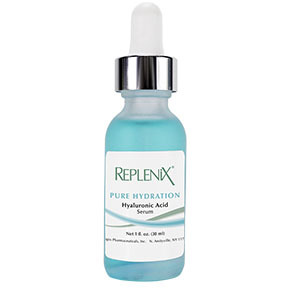 Hyaluronic acid has an extraordinary ability to retain moisture and restore elasticity to the skin. It holds up to 1,000 times its weight in water. It’s extensively used in skin care because of this. It is one of the key ingredients in most cosmetic surgeries like commercial dermal filler injections and lip augmentations e.g. Restylane®, Hylaform®, and Juvederm®. Hyaluronic acid is also present in a number of sunscreens because it is also capable of protecting the skin against UV radiation. 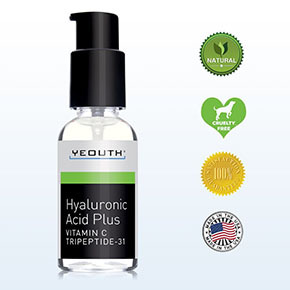 Below are the best hyaluronic acid products in the market today based on specifications, consumer reviews, and cost-effectiveness. Make sure to choose products according to your skin type and specific skin problems you’re looking to address. Look for the ‘Best for‘ line in the review boxes below. If you have concerns about skin sensitivity, it’s best to buy products with basic formulations. This way, you reduce the chances of irritation. If you’re always on the go and would like a holy grail hyaluronic acid product that combines a laundry list of benefits in a bottle, go with formulations that are suited for your skin type and has ingredients that can address your skin concerns. The below products are primarily focused on hyaluronic acid so it’s main job is to erase fine lines, plump and firm the skin, and minimize pores. Other complementary ingredients, however, are added to give your skin a boost in areas where you need them. Dermatologist tip for serums: Damp skin is more permeable than dry skin. For maximum absorption, make sure to apply serums on damp, freshly cleansed face. With over 98% organic ingredients and 1% pure HA–this is the strongest hyaluronic anti-aging serum available. Vegan, organic, oil-free, hypoallergenic, and paraben-free. It only has 4 ingredients (organic Aloe Barbadensis juice, Sodium Hyauronate/Hyaluronic Acid, Gluconolactone, Sodium Benzoate) which reduce any chances of irritation, especially for sensitive and acne-prone skin. You can apply it not just to your face but other areas where you feel could use firming and plumping up like the décolletage, the jawline, hands, etc. It’s also reported to be receptive to other topical medications like retinol, salicylic acids, moisturizers, and the like; making it perfect for troubled skin. Dermatologist-recommended, Replenix has pharmaceutical-grade formulas that ensure potency with every drop. This serum has hyaluronic acid in various molecular forms that continuously hydrate the skin in all stages. Other ingredients include Palmitoyl Tripeptide-28 that support healthy collagen production to improve elasticity and firmness. It also has a blend of antioxidants to nourish and help guard against free radical damage. Zinc PCA and Copper PCA moisturize and condition skin to reduce excess oil. The formula is non-comedogenic as well, making it perfect for oily and acne-prone skin. The downside is it can be sticky when applied generously, so make sure to coat a thin layer at a time. You can also follow up with a moisturizer to fully absorb. 100% Paraben-free. Non-greasy. Non-sticky. Non-shiny. Fragrance free. Oil-fee. Silicone free. Tested On Sensitive Skin. Allergy-Tested. Vichy, one of Europe’s leading brands for anti-aging, has come out with something akin to an anti-pollution product. The Mineral 89 serums help strengthen the skin and be more resistant to environmental aging and other stresses like fatigue. Along with their blend of hyaluronic acid and Vichy Thermal Spa Water (naturally rich in 15 beneficial minerals + antioxidants), it re-balances the skin’s moisture barrier for a healthier, more radiant glow. The texture of the serums is lightweight and easily absorbed. It’s 100% transparent, can provide 24-hour hydration, and goes well under makeup. If you live in the city and you’re always about and about, this serum should give your skin the nourishing boost and protection it needs for daily life. Oil-free. Paraben-free. Non-comedogenic. Non-acnegenic. Allergy-tested. Suitable for sensitive skin. A step up from the Vichy Mineral 89, this serum can provide a stunning 48-hour hydration. Their unique formulation of hyaluronic acid and proprietary Aquabioryl™ replenishes the skin and forms a protective film after to prevent further water loss. It doesn’t leave a sticky film as you would expect, as the serum is lightweight and absorbs instantly. Great as a morning moisturizer and under makeup. Another unique factor is its ability to distribute water evenly, which makes it perfect for combination skin. If you’re a busy bee who works long hours and would like a long-lasting solution, this one’s built for you. They say the best things come in three’s. 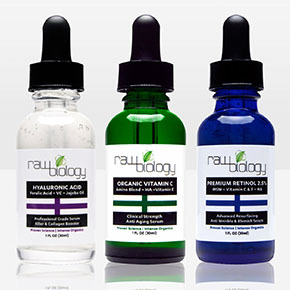 Raw Biology, known for their medical-grade organics, have packaged their anti-aging line into an all-in-one Liquid Facelift System. The brand is known for their skin restoring and rejuvenating line, targeted for aging skin. This serum combines premium ingredients scientifically designed to brighten dull complexion and resurface youthful skin. You can use them daily or every other day, depending on your skin issues and tolerance. Ironically, what makes it unique is also its drawback–three bottles that you have to religiously use in tandem to get results. If you have time carved out for your skincare routine, this might work well with you. If you’re a someone on the go, the all-in-ones might be a better fit. No Parabens, Alcohol, Sulfates or Gluten. Certified Organic, Vegan & Kosher. Made in the USA. No Animal Free Testing. 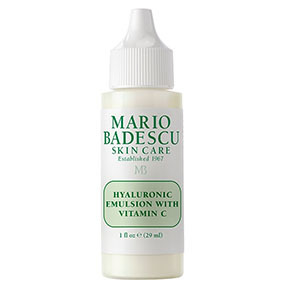 Celebrity favorite Mario Badescu is well-known for their advanced formulas tailored to correct skin imperfections. The brand’s classic line of problem-solving skincare uses high-grade botanicals and curative methods hailing from Eastern Europe. Their range of products focuses on enhancing your skincare routine to achieve a flawless complexion. The liquid is lightweight, fast-absorbing, and odorless; making it easy to layer with other products. You can use this twice a day and under make-up. One thing worth mentioning is that it has retinyl palmitate, a derivative of Vitamin A. This ingredient induces skin renewal but also sun sensitivity, so make sure to use a sunscreen after when you use this in the AM. This is a great anti-aging starter if you’re in your twenties. The ingredients are fewer as well, in comparison to the others which makes it more suitable for sensitive skin. Labeled safe for all skin types, even the most sensitive skin around the eyes–crucial if you’re concerned about crow’s feet. This makes it a stand out as most serums are too potent for this area. Cruelty-free and Vegan. Made in the USA. Glowing reviews in reference to its efficacy in as short as one week. 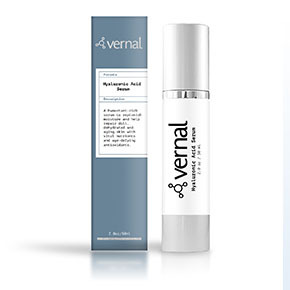 Lab Certified and highly potent, Vernals’ products always hit the homerun with their creams and serums. Their hyaluronic acid line is no different. Extremely light in consistency, it can go on flawlessly under makeup so you can use it round the clock for full efficacy. Once you’ve put it on, you can feel it start to slightly pull once it starts to dry, which is the product at work. It can penetrate the skin and target deep lines. The bottle also has a generous amount, so one can last for a long time. Aside from a good dose of hyaluronic acid, this serum is loaded with vitamins to hydrate your skin. If you have retinol in your skincare regimen due to acne, this product should fit right in. Organic All-in-One Zen Power Serum, 10% Vitamin C, 20% Peptides, Hyaluronic Acid, Collagen Includes Matrixyl, COQ10 & more. 1 oz. The Zen Power serum has a laundry list of very satisfied clients on Amazon. Their skin is reportedly brighter and even-toned, along with the usual anti-aging benefits of hyaluronic acid, peptides, and collagen. It is made in the US with all organic ingredients with a 100% money-back guarantee. If you’re looking to achieve the full efficacy of hyaluronic acid from a brand, getting complementary products is the way to go. Getting a complete set gives you an easy and proven system to follow without worrying about ingredients counterbalancing each other. Below are the some of the highest rated hyaluronic acid sets in the market today. A complete anti-aging set with the highest quality medical grade formulation. It deeply hydrates and moisturizes to reduce crows feet, fill fine lines, wrinkles, even out skin tone, bags and puffiness around the eyes. It also defends against free radicals and firms the skin. Interestingly, if you’ve ever heard of the famous and rigorous Korean skincare regimen, the concept is very similar. Free from: Parabens, Sulfate, Phthalates, Fragrance, GMO, Triclosan. Made in the USA. This dermatologist-recommended (including mine) brand put together all of their best selling products in a single line. These are manufactured using pharmaceutical grade ingredients with world-class product formulations. Not tested on animals. Gluten-free. Made in the USA. Cosmetic Skin Solutions | Skin Care. (2018). Dermatology Times. (2016). Skin barrier benefits of sunflower seed oil. Drugs.com. (2016). Restylane: Uses, Dosage, Side Effects – Drugs.com. Fda.gov. (2016). Soft Tissue Fillers Approved by the Center for Devices and Radiological Health. Home – Raw Biology. (2018). Juvederm.com. (2016). Collection of Dermal Fillers | JUVÉDERM®. Pavicic T, e. (2016). Efficacy of cream-based novel formulations of hyaluronic acid of different molecular weights in anti-wrinkle treatment. – PubMed – NCBI. Organics, P. (2018). Passport to Organics. The Huffington Post. (2013). What It Takes To Wake Up Gorgeous Like Miranda Kerr. Topix Pharmaceuticals, Inc. | Medical Grade Skin Care Solutions Dispensed by Physicians. (2018). Vernal Beauty – Anti Aging Skin Care For Face. Moisturizers, Serums. (2018). Vichy Skin Care | Vichy Laboratories. (2018). 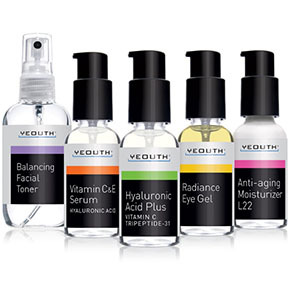 YEOUTH Natural Anti Aging Skin Care and Essential Oils. (2018).